Bimini Sands is almost full, which is highly unusual for this time of year. 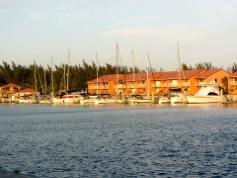 There are also quite a few boats in the North Bahamas marinas. Since we got here, a few more boats have straggled in from Florida, but the weather conditions for continuing on to Nassau and the Exumas have not been favorable. The next window probably starts Tuesday and might last until Friday. At that time there will be a mass exodus of sailboats from this marina and the three or four others in North Bimini. (Power boats are not as limited as we are by wind conditions.) We haven’t decided yet if or where we will stop on our way to Nassau. It all depends on how long the window is going to last. From here, we could go to Chub Cay in the Berry Islands, then on to Nassau. Or, we could go overnight to Nassau. We will only spend one night in Nassau because we are anxious to get to The Exumas and we certainly do not want to get stuck in Nassau waiting for good weather. From Nassau, we can sail to the northern Exumas in one day, probably going to Norman’s Cay. Once there, hopping from island to island will mean a few hour sail. 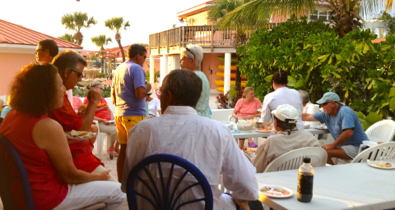 Last night we had our first sundowner get-together of this cruising season. It probably would have happened earlier, but none of us seemed motivated to say, “Let’s all meet up at the pool for sundowners.” Finally, one cruiser did and everyone came. There were four power boats and at least eight sailboats represented. A great group of cruisers are here, and I am sure we’ll see them over and over again as all of the sailboats are headed for The Exumas. One of the big mistakes we made on our first Bahamas cruise was we didn’t know about sundowners. Thus, we didn’t bring snacks to share or very much alcohol. This time we stocked up with 24 blocks of cream cheese and ingredients for our two “go to” snacks. One consists of Tostitos and a dip made of a block of cream cheese with salsa poured over it. The other also involves cream cheese, but we mix it with salmon and add a few drops of Liquid Smoke. This snack tastes like smoked salmon, served with crackers or chips. The salsa dip is quite popular, so we are rarely the only one bringing it to sundowners. We also brought quite a bit of wine and ingredients for rum punch. Last night was also our first rum punch of the season. Next time, I’ll supervise because Mark obviously added too much rum. I was fine until I stood up to return to the boat and my head started to spin. We haven’t had rum punch since our friend Lynn made us some delicious ones last spring on our trip together from Ft. Lauderdale to Marco Island. 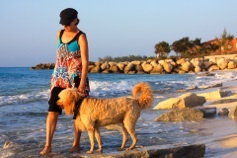 We have continued our daily walks on the beach. In the morning, Daisy takes Mark on a walk. She chooses the route and he follows. In the afternoon, she has to go to the beach with us. Sometimes she doesn’t want to exert herself, but once there, she enjoys the water and sand. At night, it’s usually a short walk. Sadly, there are no benches here for Daisy to sit on and watch the world go by. I know she misses that. We have run into some communication problems. Our wifi extender was working great until a few days ago. We were seeing many wifi signals and got the free Bimini Sands wifi with no problem. One morning it worked and that evening it didn’t. In the interim it rained, and one possible suggestion is that the USB extension got wet. We’re not sure if that is it, but we will try to get a new extension cable in Nassau. We also could use a new driver, or maybe it’s a problem in our network settings. If we can’t get it working we will be extremely limited in using the Internet and getting email. Since we were here in 2010 the availability of data has improved greatly. I don’t think Batelco was even offering data plans in The Exumas three years ago and now you can pick up their signals on remote islands. Another option open to us for Internet use is a USB unlocked air card. We have two air cards we use in the States, one for Sprint and one for Virgin Mobile. Neither are unlocked. We have been unable to find any place that will sell us an unlocked air card in the Bimini or Nassau. I found one computer store in Nassau that carries them but they were out and wouldn’t get more for two weeks. I found an unlocked AT&T 4G air card on Amazon and bought it. It is coming from Hong Kong and will be delivered in two weeks or less. I had the air card mailed to St. Brendan’s in Green Cove Springs, our mail forwarding service. They are very familiar with mailing items to the Bahamas. Any packages coming in are subject to customs and will be opened, sometimes delayed, and the recipient is then charged. The easy way is to go to Staniel Cay. They have their own airline service, Watermakers Air, which flies in from Ft. Lauderdale daily. They also bring passengers. Once we get to Staniel Cay, in a few weeks, we’ll fill out the customs form, pay $35 (I think) and give it to the Watermakers agent there. He or she will fax our form to Ft. Lauderdale. We will then have St. Brendan’s send the package to Watermakers office in Ft. Lauderdale, with customs numbers placed on the outside of the package. As soon as it arrives at the Watermakers Air office, it will be put on the next plane. We have also heard that you can get a sim card for iPads and buy data by the month from Batelco. I’m a little worried about fooling with the sim card in our iPad. I want to be sure it won’t affect our ability to use AT&T on the iPad when we return to Florida. The result of losing the use of our wifi extender will be that we won’t be able to upload blog entries as often, at least not until we get the air card or our wifi working. At this point, I’m excited about having the air card and buying data from Batelco. It will be more secure than using wifi networks. I just wish I had known about this before we left Florida so I could have brought an unlocked air card with me.